개요: Parable of the lost sheep dramatized. Application: all people are lost. Jesus, the Good Shepherd, seeks lost ones. He calls us; answer Him. The Scripture passage can be used with this application, if preferred. A certain man had one hundred sheep. (Calling. Use local sheep call or sheep sounds.) The shepherd called and the sheep followed him over the hill. He was leading them to a place where the grass was tender and the water was clean and cool. This shepherd was good. He was also brave. Once a wild animal sprang out to catch one of the lambs. But the shepherd killed the animal before one sheep was hurt. Then he led them on to good pasture. All the other sheep were safely at rest. The shepherd checked to see that they were all there. "One-two-three-four-(s.e.) - ninety seven-ninety-eight-ninety nine--" OHHHH, one was missing. Immediately the shepherd set out to find him. As he hurried through the dark, cold night, he called to the lamb-(Calling). At times he stopped to listen (Pause 3 sec. ), but heard only the night sounds. Again he called -(Calling). He came to a hilltop and stopped to listen. (Pause 3 sec.) What was that? (Pause 3 sec.) "It's my lamb!" It was the bleating of the lost lamb. 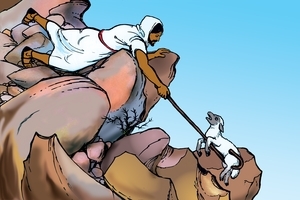 Following the sound, the shepherd climbed down the steep hill. There he found the lamb caught in the brush and rugged rocks. The shepherd was very happy. He picked up the lamb and started out for home. Upon his shoulders he carried the lamb back to the fold. All people are like lost sheep. They have gone their own way. They are lost in the darkness of sin. Jesus is the Good Shepherd. Jesus came to seek and to save those who are lost. To do this, He had to lay down His own life for us, His sheep. Only by His death could our sins be taken away. Jesus chose to die for us, to die in our place. But He did not remain dead. He arose. Now He lives always. He is the good Shepherd Who calls to us. Will you answer to His call of love? Answer Him by saying, "Here I am, Lord Jesus. I will trust in You and follow You." GRN has recorded a version of this script in 91 languages and dialects. See full list.